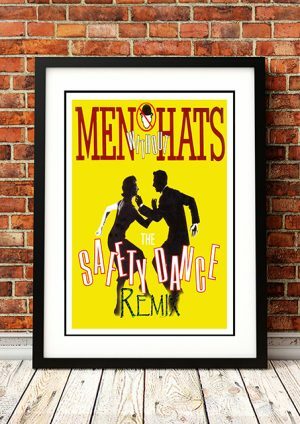 Classic Men Without Hats Band Concert Posters and Memorabilia! Buy Online Now! Ivan was the leader of the group, writing the majority of the songs and providing the lead vocals; Stefan was the guitarist; and other members changed frequently throughout the course of the group’s career. Taken from their debut, the single “The Safety Dance” became a major hit, peaking on the American charts at number three in 1983. Driven by an insistent three-chord synthesizer riff, the song was one of the biggest synth pop hits of the new wave era. The group wasn’t able to exploit its success, however. Folk of the ’80s (Part III) stalled at number 127 on the charts in America and made even less of an impact in other parts of the world. Thanks to the minor-hit title track, 1987’s Pop Goes the World was a bigger success, yet it didn’t recapture the audience their first album had gained. Released two years later, The Adventures of Women & Men Without Hate in the 21st Century failed to chart, as did its follow-up, 1991’s Sideways. The two albums’ lack of success effectively put an end to Men Without Hats’ career. We stock some awesome Men Without Hats Band Concert Posters.